price for high winter heating bills. they are not covered by the Cold Weather Rule. EAP funds are limited and households are served on a first-come, first-served basis. Visit the Minnesota Energy Assistance Program on the Commerce website for information. The Minnesota Public Utilities Commission (PUC) administers the Cold Weather Rule. For more information on the rule, visit the PUC website, email consumer.puc@state.mn.us, or call 651-296-0406 or 800-657-3782.
households. The average annual grant per household is about $545. Rent reporting program a good fit for Crookston? A University of Minnesota Crookston alum has been working with Tri-Valley Opportunity Council, Inc. on bringing his company’s rent reporting program to the area which could help people improve their credit. During Tuesday’s Crookston Housing & Economic Development Authority board meeting at RiverView Health, Tri-Valley Executive Director Jason Carlson gave a brief overview of Esusu Financial Inc.’s rent reporting concept saying it’s a way to help motivate people to pay their rent and help build credit at the same time. Esusu was co-founded by UMC alum Wemimo Abbey, who is also the founder of Clean Water for Everyone, an African social venture providing access to clean water for over 100,000 people in six countries. Esusu has recently expanded to offer rent reporting for people “confident” in their abilities to make on-time rental payments for the foreseeable future as Esusu reports on both on-time and missed payments. Participating landlords or property managers work with Esusu to provide information on their renter’s payments and Esusu reports that information to credit bureaus. They can report up to two years or 24 months of past rental payment history as long as the renter was on the same lease they are currently on. Esusu says it takes typically two to four weeks before a tenant’s reported rent payments will appear on their credit report. “It’s impossible to promise or predict a certain score increase because every person has a unique credit risk profile, and multiple factors impact a person’s score, but people who verify two years of rental history and who already have established credit could potentially see an increase of 25-50 points if their rental history does not contain any late payments,” says Esusu’s website, www.esusurent.com. Carlson said the concept was brought to him by Michelle Christopherson, UMC Director of Outreach and Community Engagement, and he then set up a meeting with Abbey and Tri-Valley’s Community Services Program Director Maureen Hams. Carlson said he’d like to work with CHEDA’s Executive Director Craig Hoiseth and staff to see if this is a fit for Crookston. UMN Crookston Chancellor Mary Holz-Clause added that they are piloting the program on the Crookston campus, as well as in New York, and UMC students are learning about financial literacy and how to figure out their resident payments. Development, Housing, and Finance Committee on Monday, March 18. The Good Food Access Fund (S.F. 1354) helps address the problem of Minnesotans having limited or no access to healthy, affordable foods, like fruits and vegetables, dairy, whole grains, lean meats and poultry. The limited access increases health related risks and aids in the alarming increased rate of obesity in today’s society. 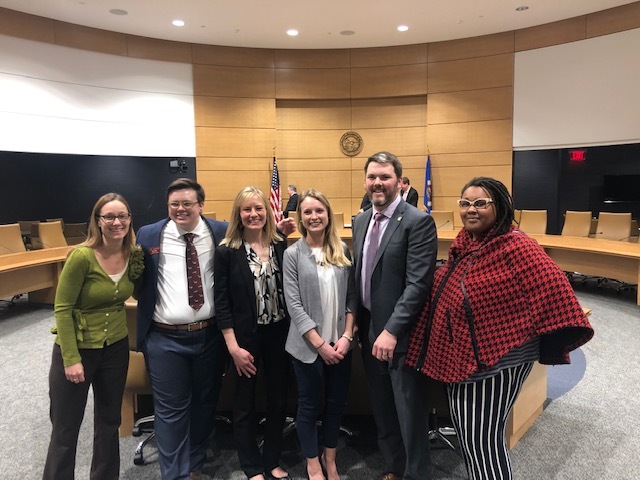 The Good Food Access Program has proven positive impacts on improving access to healthy, affordable foods while boosting Minnesota’s local economy. Jami Lee (Nutrition Services Manager) speaks at a press conference for the farm to school bill at the capitol. 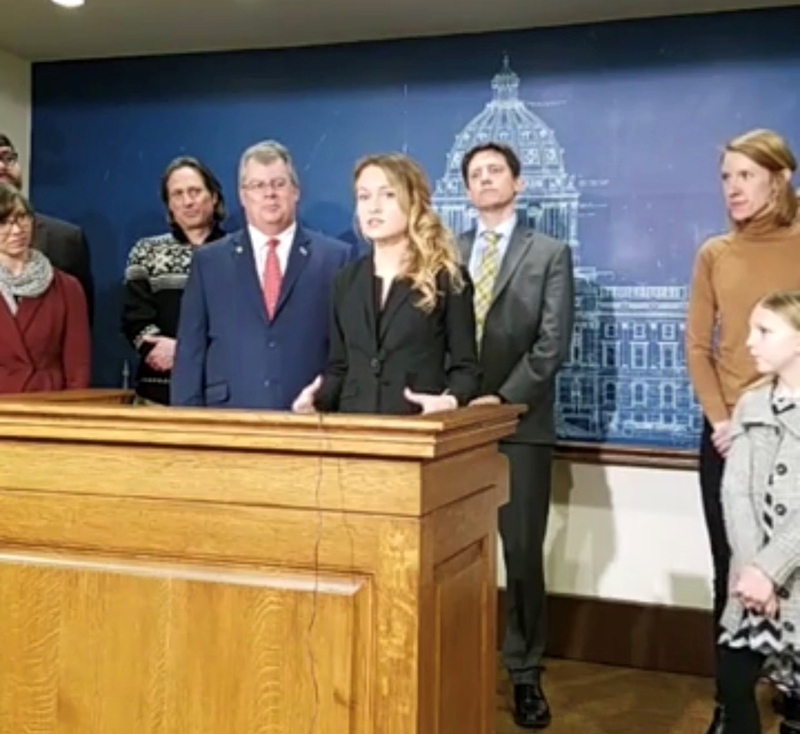 Jami Lee (Nutrition Services Manager) speaks at a press conference for the farm to school bill on Wednesday, February 13, at the capitol. WHAT IS “FARM TO HEAD START?” “Farm to Head Start” is a type of Farm to Early Care initiative. Farm to Early Care initiatives connect young children with healthy, locally grown foods and support farmers in their communities. Farm to Early Care’s three core components are serving locally grown foods in Early Care meals and snacks, offering food and farming-related educational activities for children and organizing food and farming-related family engagement activities. 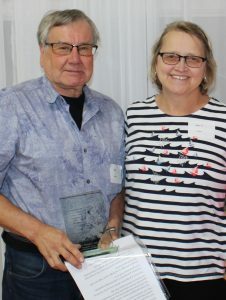 Tri-Valley Opportunity Council operates a unique Head Start program, serving the children of migrant farm workers who travel to Minnesota during the growing season. 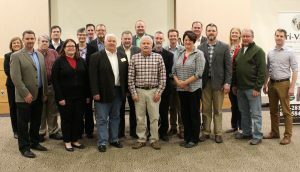 The Institute for Agriculture and Trade Policy recognized the opportunity to create a meaningful connection for children between their families’ deep ties to farming and the foods in their meals through Farm to Head Start activities. Relatively new to her position as Tri-Valley’s Nutrition Services Manager, Jami was eager to find new ways to help children develop positive eating habits. She also recognized the potential for Farm to Head Start to help meet that goal, and was enthusiastic about the idea of supporting farmers while teaching children where their food comes from. Both IATP and Tri-Valley saw Farm to Head Start as a chance to highlight the crucial work migrant families do to feed the community. 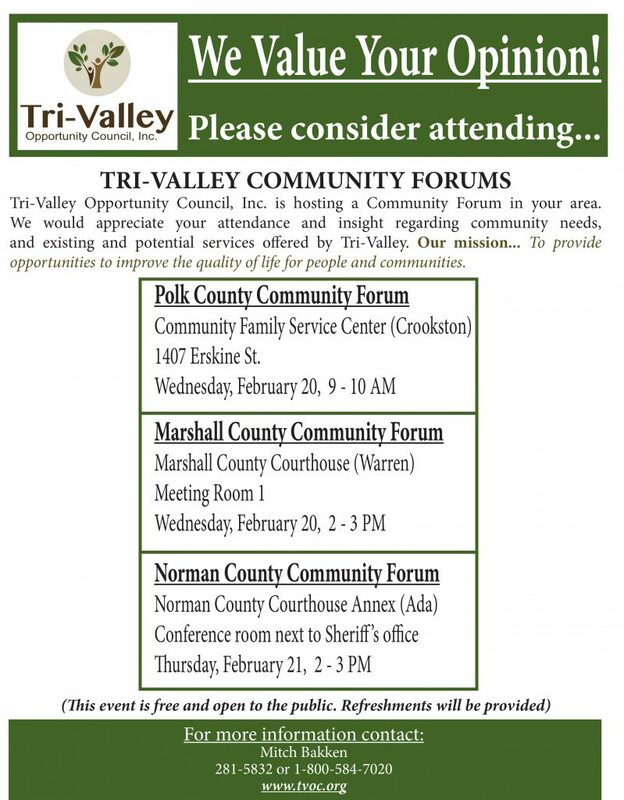 Tri-Valley Opportunity Council, Inc. will hold three community forums in the month of February. Two of the forums will be held on Wednesday, February 20. The Polk County community forum will be held in Crookston at the Crookston Family Service Center (1407 Erskine St.) and will run from 9-10 am. The Marshall County community forum on February 20 will be held in Warren at the Marshall County Courthouse (meeting room 1) from 2-3 pm. 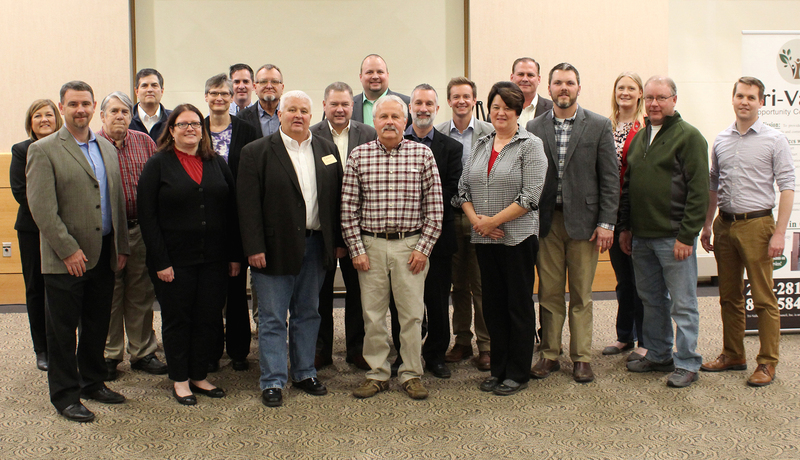 On Thursday, February 21, the Norman County community forum will be held in Ada at the Norman County Courthouse Annex (conference room next to Sheriff’s office) from 2 – 3 pm. These forums are free and the public is encouraged to attend. Refreshments will be provided. offered by Tri-Valley. Please mark your calendars and plan to attend! please contact Mitch Bakken at 1-800-584-7020 or mitch.bakken@tvoc.org. MNsure’s sixth open enrollment period ran from November 1, 2018 to January 13, 2019. Minnesotans can still enroll if they experience a qualifying life event, such as having a baby, getting married, moving to a new area, or losing other health coverage. More information about special enrollment can be found here. Pictured left to right: Rachel Fruhwirth, Sibley County Public Health Supervisor; Allie Elbert, Meeker-McLeod-Sibley Community Health Services Administrator; Nancy Mellesmoen, CLT Vice-Chair, Tri-Valley Opportunity Council; Commissioner Jan Malcolm, Minnesota Department of Health; Mary Bachman, Meeker-McLeod Sibley SHIP and CLT Coordinator; Mike Huberty, Meeker County Commissioner. At this ceremony, the Meeker-McLeod-Sibley Healthy Communities Leadership received a Certificate of Recognition for their commitment and contributions to advance public health locally. In its 20 years of operation, the MMS Healthy Communities Leadership Team works to coordinate health promotion and maximize its resources. It serves as the community health board’s SHIP community leadership team, provides competitive mini-grants to community projects focused on priority health issues, and coordinates a joint community health needs assessment with local hospitals. Through collaboration, the group tackles priorities together, like creating portable breastfeeding stations and addressing barriers to preschool transportation. 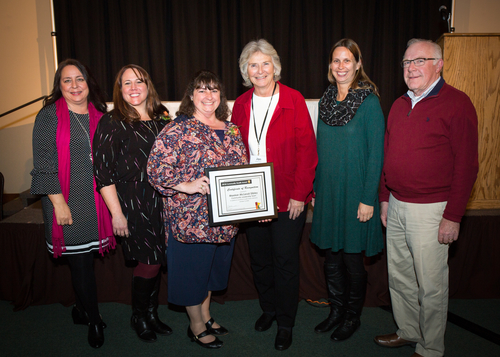 Allie Elbert, Meeker-McLeod-Sibley Community Health Services, and Nancy Mellesmoen, Tri-Valley Opportunity Council, accepted this award on behalf of the MMS Healthy Communities Leadership Team. For more information on the Meeker-McLeod-Sibley Healthy Communities Leadership Team, please visit www.mmshealthycommunities.org . The Tri-Valley Opportunity Council, Inc. Foster Grandparent Program held its annual recognition luncheon at the Crookston Eagles Club on Wednesday, October 10, 2018. Jeanette Larson, Senior Programs Manager began the event by welcoming the Foster Grandparents and guests to the banquet. Jason Carlson, Tri-Valley’s CEO thanked all of the volunteers for the difference they are making in the lives of others in our communities. Jason then introduced the newly hired Director of Senior Programs, Marley Melbye. Marley shared about herself and how excited she is to begin this position and how she is looking forward to working with the Foster Grandparent Program. Kristal Abrahamson then introduced the Advisory Board members. Sally Erickson was the speaker for the day. Sally Erickson holds degrees in Business and English Writing from Concordia College in Moorhead, Minn. She has spent most of her career as a technical writer in the software industry. She has also written a book entitled Letters to HEAVEN. This is Sally’s story about cancer, death, and hope. The volunteers really enjoyed her presentation. Following Sally’s message, the “World of Difference” awards were given to individuals who were nominated by professional staff at their volunteer site. “With the little things you do every day, your impact spreads far and wide. Your commitment to improving lives inspires and motivates us all… You make a world of difference.” is engraved on the award along with the recipients’ name. 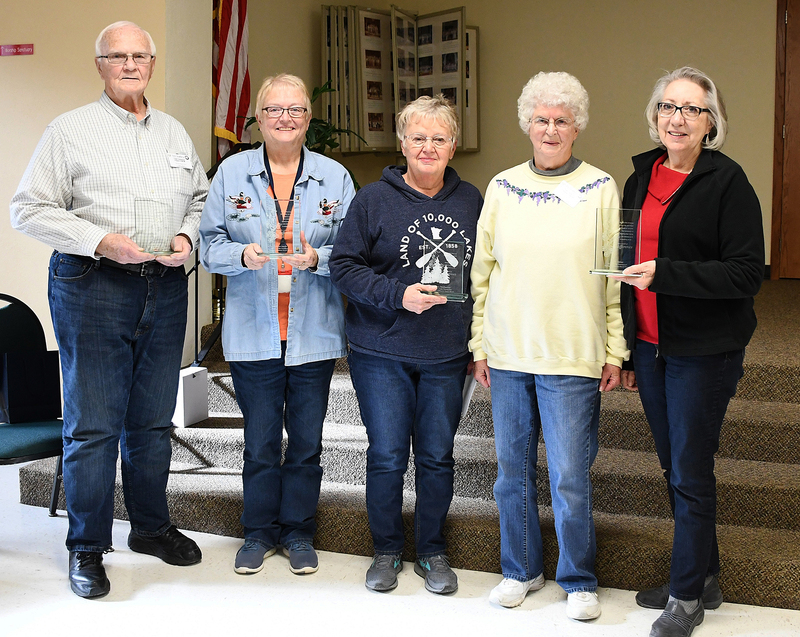 Recipients of the World of Difference Award are Grandma Doris Pontow (Discovery Place Early Learning Center, Thief River Falls, 6 year volunteer), Grandpa Milo Trangsrud (Challenger Elementary School, Thief River Falls, 2 year volunteer), Grandma Kathryn Haider (St, Michaels School, Mahnomen, 6 year volunteer), Grandma Mary Steinbrenner (Magelssen Elementary, Fosston, 4 year volunteer), Grandma Linda Stelzer (St. Joseph’s Elementary, Moorhead 2 year volunteer) and Grandpa Art Wood (Dorothy Dodds Elementary School, Moorhead 1 year volunteer) . For more information on how to become a Foster Grandparent, Caring Companion or how to receive Caring Companion services, please call Marley, Jeanette, Jean, or Kristal at 1-800-584-7020. Although a scheduling conflict led to the postponement of public tours of Crookston’s new, 30-unit townhome complex on North Broadway, various stakeholders, partners and representatives of other agencies who helped make the project a reality gathered in the U of M Crookston’s Bede Ballroom on Thursday to celebration the (near) completion of the project. 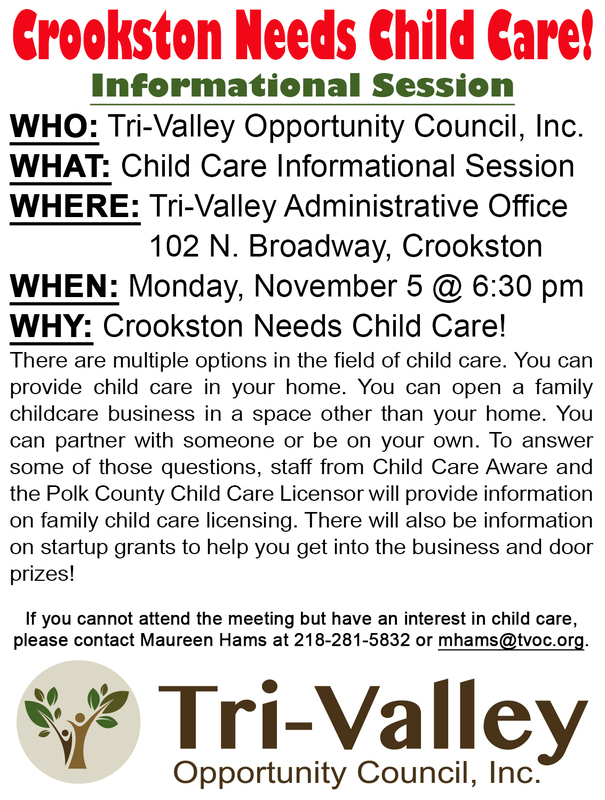 (Crookston, Minn.)- At a recent Crookston city council meeting, the topic of lack of child care and licensed child care options in in the city went from important to urgent and has become one of the community’s “most pressing issues”. But how do we change this? Have you ever thought about opening your own child care business but have some questions? If so, you’re in luck. There will be an informational session on Monday, November 5 at 6:30 pm in the Tri-Valley boardroom located at 102 N. Broadway in Crookston. Did you know? There are multiple options in the field of child care. You can provide child care in your home. You can open a family child care business in a space other than your home. You can partner with someone or be on your own. 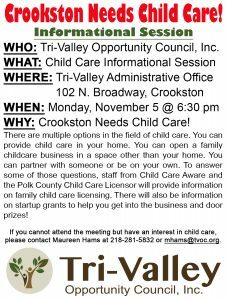 To answer some of those questions, staff from Child Care Aware and the Polk County Child Care Licensor will provide information on family child care licensing. There will also be information on startup grants to help you get into the business and door prizes!